Hi friend! I hope you’ve been having a great week! Summer is my favourite time of year for so many reasons: bonfires, camping, sunshine, travels, warm weather, swimming, and my birthday are just the ones I can think of off the top of my head. With the warmer weather often comes a desire to eat lighter, cleaner, and quicker so we can spend more time adventuring and less time in the kitchen. Enter super smoothies! Not only are they simple to prepare, but they take advantage of the best seasonal produce available, can be eaten/drunk on the run, and can help protect your skin from the inside out. That sounds like a pretty epic win to me, so I set out on a mission to create the greenest, glowingest smoothie I could with all the beautiful bounty I found at the farmer’s market. Thus the Glowing Goddess Green Smoothie was born. I hope you enjoy drinking it as much as I enjoyed creating it! Green smoothies like this one are an amazing source of vitamins, minerals, antioxidants, and a plethora of other beauty boosting elements. One of the main beauty boosters that is most abundant in green smoothies is a molecule called chlorophyll. This molecule gives plants their green colour and essentially functions as the “blood” of the plant by aiding in the process of photosynthesis whereby sunlight, water, and carbon dioxide are turned into carbohydrate. Pretty frickin’ amazing, but not the subject of this post. Relaxation of muscles—making it an excellent mineral for women who suffer from menstrual cramping or individuals who have a hard time falling asleep. Slowing the aging of skin by stabilizing RNA and DNA, meaning fewer wrinkles and a more glowing complexion! Promoting healthy hair growth, and strong bones, nails, and teeth, which are all necessary to keep us glowing from the inside out! In order to boost your beauty glow from this smoothie I’ve added a few other special ingredients. Cucumbers are rich in silica, a mineral that is necessary for strong hair, teeth, nails, and glowing skin. Coconut milk kefir is not only a great source of medium chain fatty acids to promote energy production in the body, but it’s also rich in probiotics, which are the good bacteria necessary to keep your digestive system happy and healthy. A healthy digestive system is the foundation of vibrant health and lustrous skin, hair, and nails! Hemp hearts are a great source of omega-3 fats that help regulate the inflammatory response in the body, thereby reducing skin redness, water retention, and breakouts. Alrighty, so now that you know why you’re drinking this beautiful concoction, let’s take a look at how to make it. Cut zucchini, cucumber, and celery into small chunks. Add all ingredients to blender and combine until smooth and creamy. Can drizzle with hemp oil and a few extra hemp hearts for an extra nutrition boost! Makes about two 500ml servings. Well friend, that’s the chlorophyll-rich, body lovin’ Glowing Goddess Green Smoothie. It’s the perfect accompaniment for sunny summer days and skin-baring sundresses. 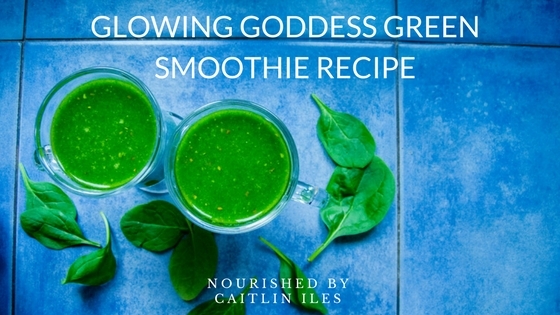 If you’re looking for more awesome smoothies to nourish you from the inside out then make sure you download my FREE Sensational Summer Smoothies E-Book right here! Thanks for stopping by and have a wonderfully whimsical week!